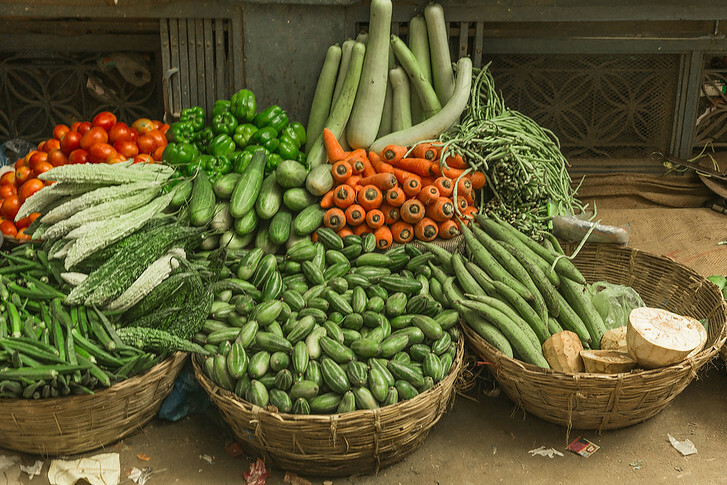 Are you headed to Nepal and curious what there is to eat? Nepalese cuisine bears a lot of Indian and Tibetan influences (given its location) but has its own distinctive dishes. 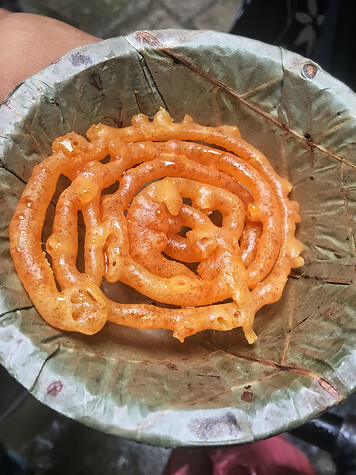 Today I wanted to share some of the famous foods in Nepal that you should definitely try! First, a couple quick facts about what you can expect when eating in Kathmandu and greater Nepal. 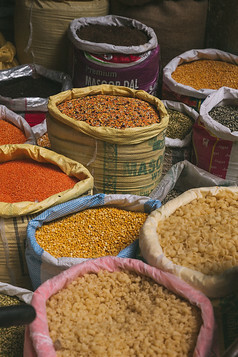 Gluten Free, but Heavy | Nepali food tends to be rich in flavor and spices. It incorporates lots of rice, lentils, chickpeas and curries so it can sit in your stomach if you’re not quite used to it, but on the flip side, it’s typically gluten-free. Vegetarian Friendly | Nepalese people are Hindu so they don’t eat beef. In fact, much like India, you’ll see cows roaming the streets or even plopping down for a rest right in the middle of the road. Instead of beef, Nepalese will use buff or buffalo meat. Still, the majority of Nepalese cuisine is vegetarian friendly. Drink Purified Water | We toured some rural areas where the people use well water for cooking – make sure you double-check that the water used to make any tea or coffee you drink came from boiled water. For all the hotels we stayed at, we received 2 bottles of water each day in our room. Nepal has a huge plastic waste issue so if you can, bring your own water bottle to be refilled. 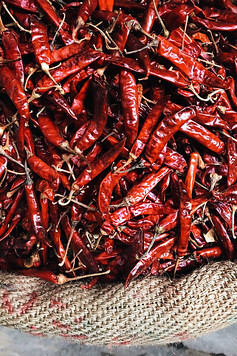 Spice | If you don’t like spice of any kind, you might be in for a shock. 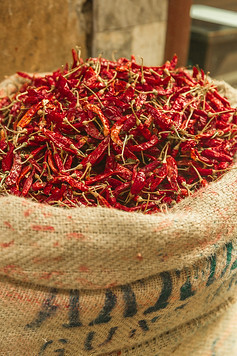 Nepalese cuisine uses lots of pickled spice and spicy curries! Dal Bhat is probably the most famous food in Nepal – it’s such a staple for locals you could even call it Nepal’s national food. If you’re going trekking, expect to be served traditional dal bhat at every homestay… at least twice a day. Dal Bhat Tarkari means lentil soup (dal), rice (bhat) and curried vegetables (tarkari). The set is usually served on a metal platter and is “all you can eat”. It’s traditionally vegetarian but occasionally you might find it served with chicken or meat. How to eat Dal Bhat: You can eat it with a fork but if you want to do as the locals, pour the dal over your rice and then mix in the curry and sauce. Use your right hand to make small balls of food and then push that into your mouth using your thumb. Traditionally, Nepalese eat with their right hand and save the left hand for… well, you know. If you’re going trekking, chances are this will be your food morning and night. It’s filling and nutritious.. but not necessarily inventive. Dal Bhat bears lots of Indian influence. 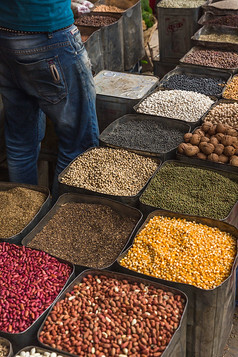 For the other main staple of Nepalese food, you’ll notice some Tibetan similarities. 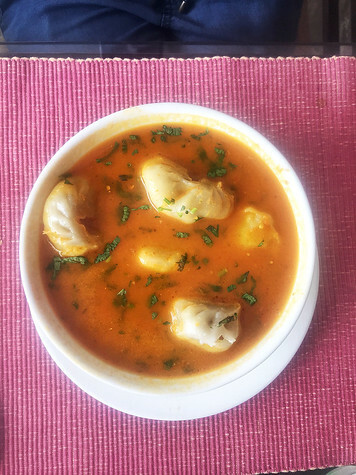 Momos are like a dumpling, but served as a main entrée. Usually you get a full plate of 10 momos per order. Made from white flour, you can find them steamed, served in a bowl of curry broth or fried. 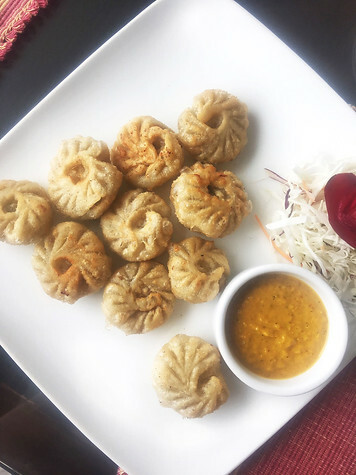 Momos were typically filled with buffalo meat, but nowadays you can get them with either vegetables or chicken as well. The shape can depend on the area, but either look like a leaf or a full circle. Nepal has many indigenous groups and the Newari are the people local to the Kathmandu Valley. 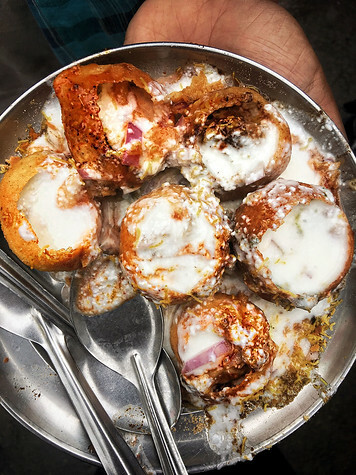 Their cuisine is famous for over 200 dishes and we tried Bara and Aloo on our food tour of the city. The coarsely ground bread is made from lentils, with ginger and cumin, to form a dense flatbread. We ate it with a spiced potato salad (aloo sadheko), served cold. 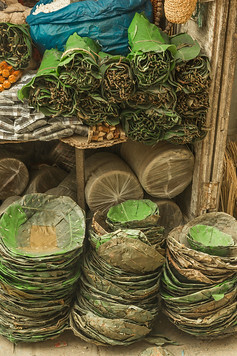 Many Nepalese snacks seemed to resemble Indian snacks. You can find them in road side carts or small stands along the streets and main squares. Try to avoid food that’s been sitting out. Instead get freshly fried snacks at places where you see lots of locals congregating! Kind of like a doughnut meets bagel, sel rote is a crisp, puffy dough that’s been deep fried. 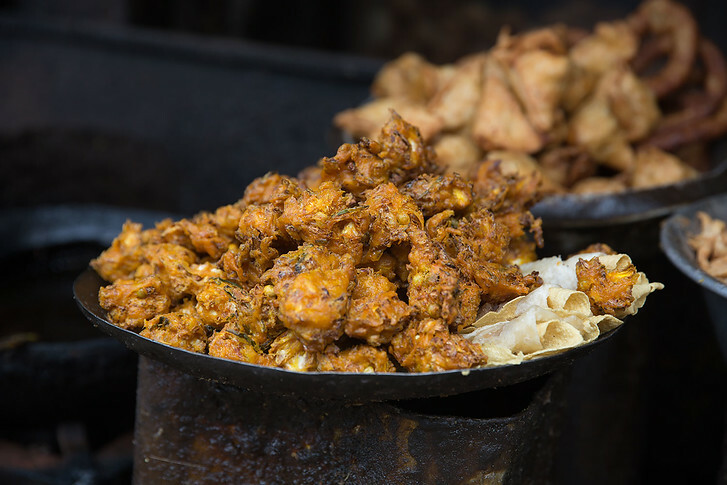 You’ll find this street stall snack along roadsides and during Hindu festivals like Tihar and Dashain. They’re best eaten as a breakfast snack with yogurt, or as an afternoon snack with some veggies! Samosas are some of my favorite Indian appetizers so when I discovered you could get them fresh off the street in Nepal, I was excited! Samosas are said to have been first brought to the Indian subcontinent by Muslim traders but so many cultures have a version of a fried meat pastry that who really knows? In Nepal, you’ll typically find that samosas are HUGE triangle-shaped balls of pastry, made from white flour. Inside they’re typically a vegetarian mixture of potatoes and spices (if you don’t like spicy food you might want to take a small bite first). At some street stalls, the samosas we ordered came with a shallow pan of neon orange sauce, that tasted lightly sweet and helped to cut the spiciness. If you want to try samosas in Nepal, make sure to get them FRESH. You don’t want one from a pile that’s been sitting in the hot sun and dusty air all day. 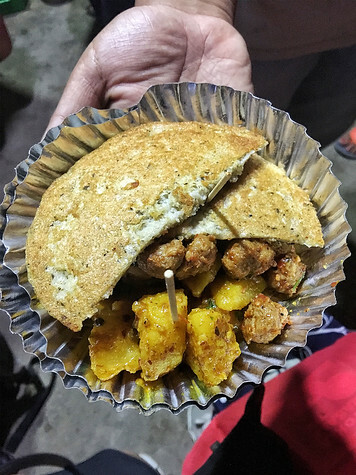 We went to one place that was popping with locals on our Nepalese food tour and tried some on our own from a lady who was frying them in a hot pan, roadside. Before going to Nepal, I did some quick research to learn about the food and heard people raving about pani puri. 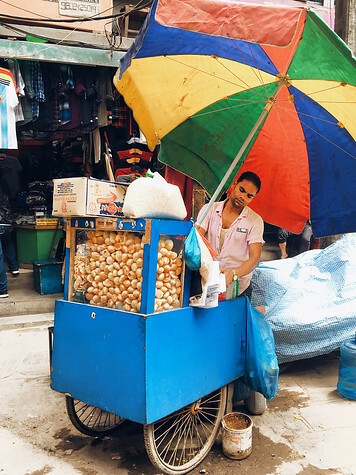 This Indian snack is typically sold road side, and throughout Nepal we saw men standing by these blue carts stuffed with empty panipuri shells. Classic pani puri is hallowed out and filled with rose water. For a more savory option, try pani puri chaat masala, where the puffed shells are filled with soft potatoes, chickpeas, coriander, chili and crispy noodles. They’re surprisingly filling! Again these can be spicy but we recommend eating it with the cooling yogurt-type sauce for some heat relief. Nepali chai tea is served everywhere and quite delicious! Warm black tea, spiced with milk and heaps of sugar is quite comforting when it’s cold out. I bought a box of the local blend as a souvenir to take home. Lassi is a popular sweet yogurt drink and quite delicious. 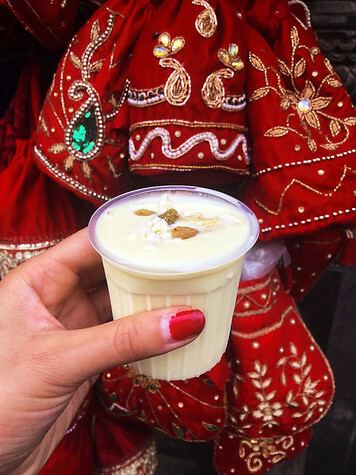 The water curd is mixed with sugar and water to form a thick, refreshing drink. If you’re worried about street food, try to make sure the lassi you’are drinking has been made with purified water. The best way to select a restaurant is to look at the volume of customers they have! 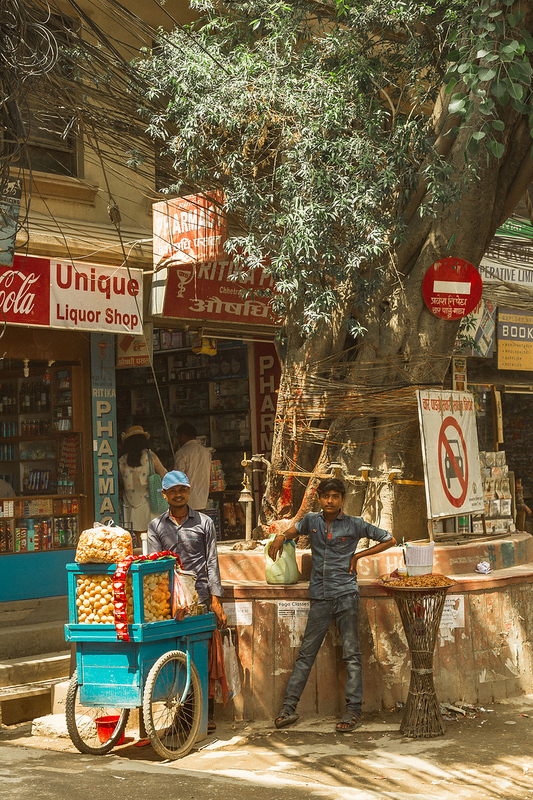 In Kathmandu Durbar Square, there’s a small lassi street stand that’s very popular with local Nepalese – again, we learned about it from our local food guide on our tour. The nice thing about this shop is they sprinkle some nuts on top! I will say though, lassi wasn’t served ice-cold. It’s more like room temperature – but still delicious! Local Nepali beer includes Sherpa, Gorkha, Everest and Kathmandu. We gave the local rice wine a try (raksi) which tasted a bit like rubbing alcohol! Like most of Asia, Nepalese people enjoy sticky sweet dessert. Traditionally the desserts you’ll find will be made from nuts, palm sugar and milk curd (sorry, no chocolate!). This neon snack looks like an orange lattice swirl. It’s made from a dough batter drizzled to form a circular shape, then dunked in some sweet sauce. The color was a little intimidating but it tastes very similar to a funnel cake! It is very sweet. The direct translation of juju dhau is “King Curd” and you’ll find this sign all over street stalls in Bhaktapur. Although “curd” doesn’t sound appetizing – give this snack a go! It’s rich, creamy and flavorful without being too sweet and I really enjoyed it. Standard yogurt is made with cow’s milk. For the King’s yogurt, fresh buffalo milk is used instead, giving the yogurt a richer, more flavorful taste and thicker consistency. To find it, head to Bhaktapur, the ancient Newa City, where this is the local specialty. Locals make the curd by first boiling milk, sweetening it with honey and then leaving it to pasteurize in red clay pots. The clay pots are traditional to Bhaktapur (you can find souvenir clay objects all over town) and their porous nature allows excess liquid to evaporate slowly, enabling the yogurt to have a firm, creamy texture. To the Newars of Nepal, dhau denotes purity and so most of their auspicious ceremonies and festivals will involve the yogurt. Don’t miss it! On our secret Kathmandu food tour, we had the chance to try yomari, a sweet bun that originated as a festival food. Our local guide explained that traditionally it was made only during Yomari Punhi, the largest Newar festival which marks the end of the rice harvest, as an offering of thanks to the Gods for a good harvest. The festival dates is typically around November / December, but it shifts slightly each year based on the lunar calendar. Locals love it so much that now you can find the bread nearly year round. The steamed bun is made from rice flour dough, specifically of rice from the new harvest, and then steamed, which gives it that transparent white look. Inside you’ll find a sweet paste made from molasses, sesame seeds and coconut. It reminded me of some Chinese sweet buns. 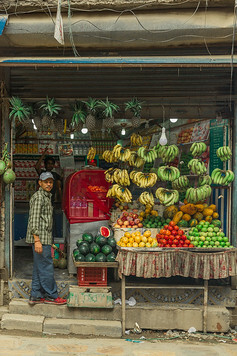 I highly recommend the Kathmandu food tour that we took, which introduced us to some hidden hole-in-the-wall restaurants and snack carts that we never would have found on our own. Our guide was extremely knowledgeable and shared some tidbits about local Nepali culture and food that none of our other guides thought worth mentioning! If you want variety and aren’t afraid to experiment, the food and shopping tour (we combined it to do a little souvenir shopping) was a fun day. A hidden courtyard is home to the most famous samosa shop in Kathmandu, but it’s only known to the locals. Our guide led us through this alley, then ducked through another one… and we emerged into a square teeming with locals happily munching on deep fried snacks. Tip Top also sells puri and julebi. For a fancier option, try this fine dining restaurant inside the 5 star Dwarika’s Hotel. They offer a 6 course or 9 course meal, presented in the traditional Nepalese way, and it’s an unforgettable experience. Dwarika’s is the finest hotel in Nepal, and built in the traditional Nepalese style, so it’s worth staying here too! The staff dress in traditional clothing from Nepal’s different indigenous groups and all the dishes are served in traditional bowls. It’s a feast for all the senses! If you want a change from Nepalese food, stop at this tiny shop in Thamel for one of the best falafels in Kathmandu. A friend who had been to Nepal before recommended it, and after trying the falafel wrap and mango lassi, I was sold! The owner is very friendly and the food is fresh and filling. Funny enough, I also see now it’s the #1 rated restaurant in Thamel on TripAdvisor. A veritable institution among locals, this shop serves lassis and lassis only. Available in two sizes and topped with cashews, pistachios and dried fruit, it’s delicious! This was another spot our local guide led us to. This 2 floor restaurant is huge in Kathmandu as all the international travelers and expats hang out here. The Israeli style cafe serves up all-day breakfast, fresh bread, juices and espresso. Sit down on the floor cushions and hang out with the other travelers. There’s also another location in Pokhara. And that’s it! Our sampling of delicious cuisine in Nepal. Have you been? What are you most looking forward to eating? Check for flight deals to Nepal here and expect crowds and higher prices in spring and fall, when trekking season opens to Everest Base Camp. We went in the off season at the start of Monsoon summer and were lucky with the weather! Lastly, be sure to visit Nepal with travel insurance. Kathmandu and Pokhara are hectic, crowded cities with non existent sidewalks and motor traffic everywhere. Trek safely, as altitude sickness can impact anyone. A guy in our group was hit by a motorcycle and ended up with a 4 figure hospital bill. Whether phone gets stolen, or an injury forces you to cancel all or part of your vacation, travel insurance will help when you need it most. Get a quote for your trip here.